Garaventa’s Evacuation Chair – The Evacu-Trac CD-7, provides safe and simple emergency evacuation for the mobility impaired. During an emergency even most elevators are disabled (for safety reasons). This poses a problem when evacuating wheelchair users and other mobility impaired persons from school storey floors and above. The Evacu-Trac Emergency Evacuation chair has a patented brake and speed governor making this chair very safe and simple to use. The Evacu-Trac is extremely simple to use: It unfolds with one pull of the handle! The open sides of the Evacu-Trac are designed for easy transfer of a passenger from a wheelchair, with minimal assistance. 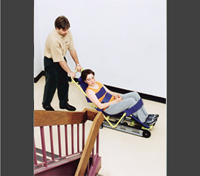 Unlike some other evacuation chairs, the Evacu-Trac CD-7 has low handle height. This allows for those assisting in transfers to work from either the front or back. This creates much more available working space during the transfer. The Evacu-Trac is normally kept in a storage cabinet located near the upper stair landing, ready for use in an emergency situation. Opening up the Unit Remove the Evacu-Trac from the storage cabinet and place the unit on a flat surface. Grasp the handle and pull it up in a quick, smooth motion. This will lock the Evacu-Trac in the open position. The Evacu-Trac sets up simply; with one pull up on the handle - it is ready to work! The open sides of the Evacu-Trac are designed for ease of transfer from a wheelchair from either the left or right hand side. High functioning mobility impaired individuals can often transfer own their own or with minimal assistance. Once the passenger is positioned in the Evacu-Trac, 3 Velcro™ straps are wrapped securely around the passenger's chest, waist and lower legs. On stairs, the tracks securely grip the stair noses and the hydraulic speed governor controls the descent speed regardless of the stair covering. On flat surfaces, Evacu-Trac can be pushed on its wheels as easily as a stroller. These features allow the user to be transported to an area clear of the emergency rather than being stuck in an Area of Refuge awaiting further assistance. It is recommended to use the inside of the stairway to allow room for other traffic and to make it easier to turn corners at stairway landings. To turn the evacuation chair on flat surfaces, the attendant pushes down on the handle and pivots the unit on the rear auxiliary wheels. The default position of Evacu-Trac brake is the on position. To descend the stairs, release the brake by slowly squeezing the brake lever. Descent speed can be slowed by reducing pressure on this lever. The patented hydraulic speed governor limits the maximum descent speed to approximately 3feet per second, allowing even a small attendant to safely evacuate much heavier passengers. On flat surfaces, Evacu-Trac can be pushed on its wheels as easily as a stroller. Simply depress and hold the brake release handle and push. To turn the evacuation chair on flat surfaces, the attendant pushes down on the handle and pivots the unit on the rear auxiliary wheels. Once clear of the emergency area, park the Evacu-Trac on a flat surface by letting go of the Evacu-Trac and the fail-safe brake is automatically deployed.